578 pages | 192 B/W Illus. Epilepsy, one of the most prevalent neurological disorders, affects approximately 1% (greater than 60 million) of the world's population. In an estimated 20 million of these patients, seizures are not controlled even by multiple anti-seizure drugs, and are extremely difficult to predict. 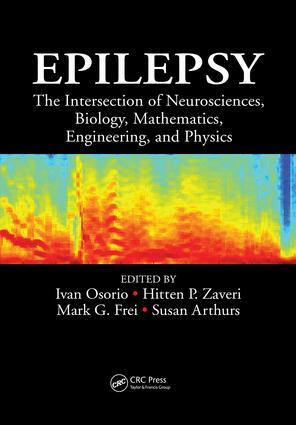 Epilepsy: The Intersection of Neurosciences, Biology, Mathematics, Engineering, and Physics seamlessly brings together the neurosciences, mathematics, computational sciences, engineering, physics, and clinical epileptology to present to readers a highly didactic, integrated, clear and practically useful knowledge base and research directions. Calls attention to nocturnal frontal lobe epilepsy as a potentially fruitful paradigm for advancing seizure prediction. Of all neurological disorders, epilepsy demands of investigators the broadest and deepest knowledge of dynamical, control, and system theories, knowledge that cannot be amassed without possessing a certain level of sophistication in relevant areas of neurosciences, physics, mathematics, and engineering. Narrowing the inescapable cultural chasm that commonly fragments multidisciplinary efforts, this book captures and enriches the burgeoning interdisciplinary synergism in the nascent field of dynamical epileptology. Neurodynamics and Ion Channels: A Tutorial. Impact of Biases in the False-Positive Rate on Null Hypothesis Testing..
Seizure Prediction: An Approach Using Probabilistic Forecasting..
Are Interaction Clusters in Epileptic Networks Predictive of Seizures? Nocturnal Frontal Lobe Epilepsy: A Paradigm for Seizure Prediction? Autosomal Dominant Nocturnal Frontal Lobe Epilepsy: Excessive Inhibition? Nocturnal Frontal Lobe Epilepsy: Metastability in a Dynamic Disease? Hitten P. Zaveri is an Associate Research Scientist within the Department of Neurology at Yale University in New Haven, Connecticut.